Did you know today is National Pound Cake Day? Well, twist my arm into making something sweet AND with booze. 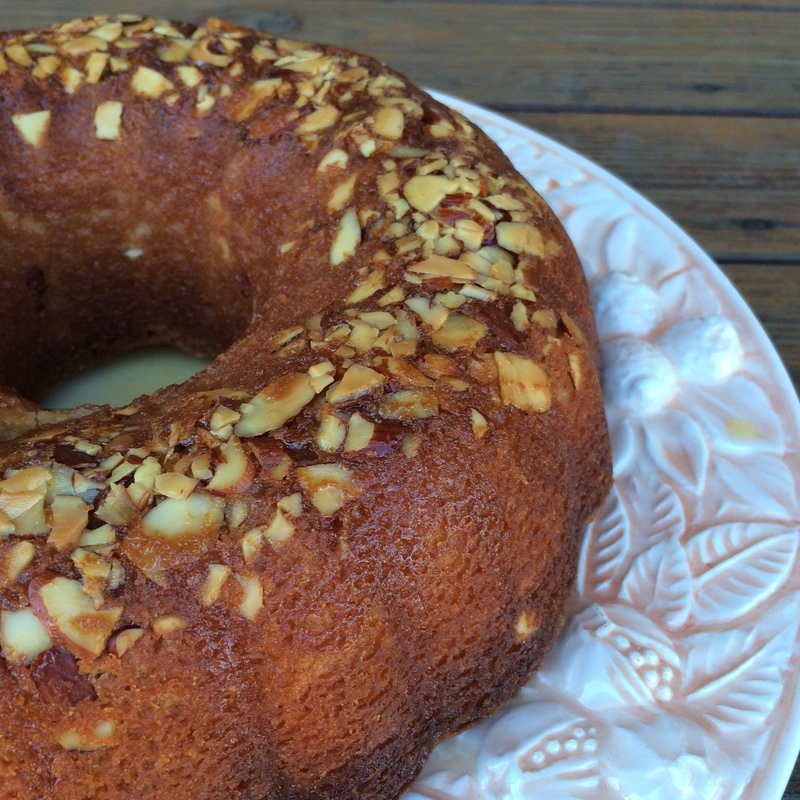 I have had my eye on this Amaretto Almond Pound Cake from Southern Living for awhile. 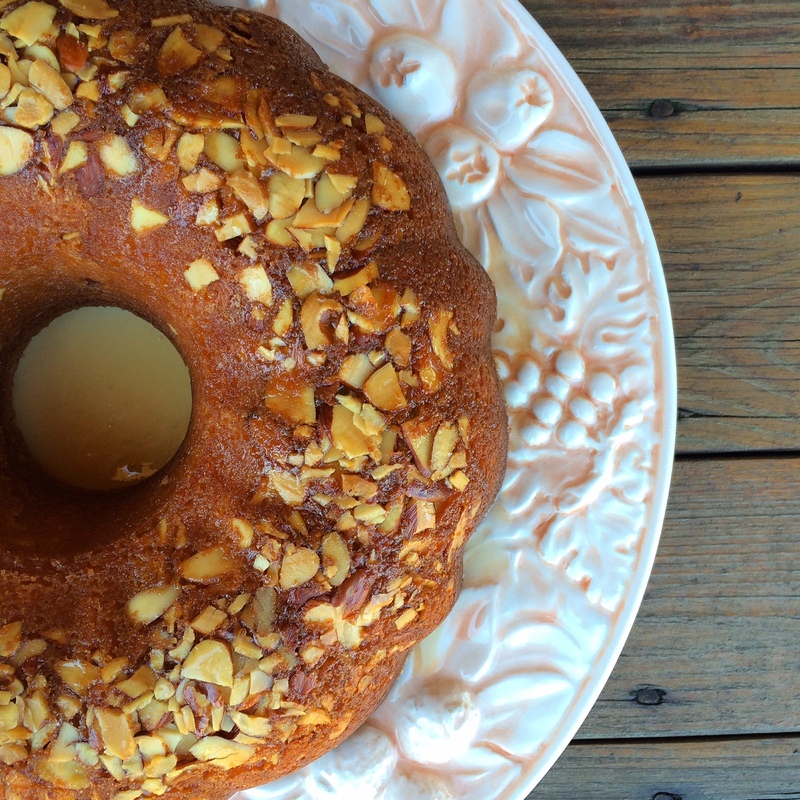 If you like Amaretto and Almond flavored pastries in general, you are going to love this pound cake. This reminds me of the fancier version of our favorite Rum Cake recipe. It looks a little classier, is completely from scratch, and Amaretto just sounds a little less (drunk) than Rum. My only caveat with this cake, and pound cakes in general, is baking time. Maybe it’s my oven, but I feel like my pound cakes and bundt cakes always take longer than instructed. And it’s torture testing a cake with a toothpick, only finding it’s most definitely not ready…then you start to wonder if you did something wrong, then you worry the cake is going to be a bomb and ohmygosh it just spirals from there. But I did give it some more baking time and we were good to go. You are going to douse this cake with some ridiculous Amaretto Glaze anyways. Next time I make this cake, I may consider doubling the glaze recipe, but that could be trouble. 1. Preheat oven to 325°. Beat butter and cream cheese at medium speed with a heavy-duty electric stand mixer until creamy. Gradually add sugar, beating at medium speed until light and fluffy. Add liqueur, vanilla, and salt, beating just until blended. Gradually add flour to butter mixture, beating at low speed just until blended after each addition. 2. Add eggs, 1 at a time, beating at low speed just until blended after each addition. 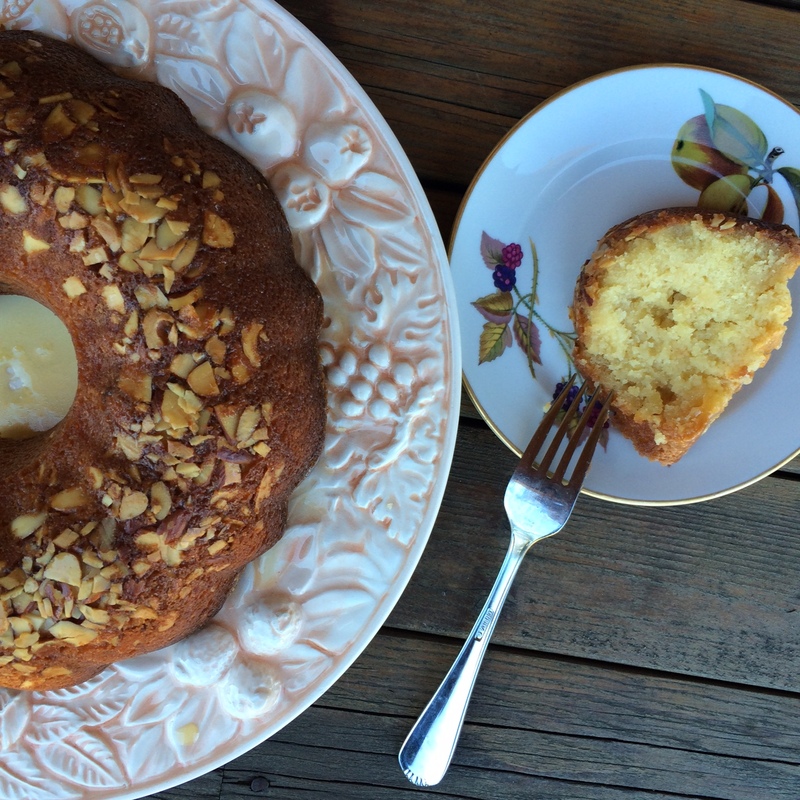 Sprinkle almonds over bottom of a greased and floured 12-cup Bundt pan; pour batter into pan. 3. Bake at 325° for 1 hour and 5 minutes to 1 hour and 10 minutes or until a long wooden pick inserted in center comes out clean. NOTE: my oven took about 1 hour and 20 minutes. Adjust accordingly. 4. During last 10 minutes of baking, prepare Amaretto Glaze. Bring sugar, butter, almond liqueur, and water to a boil in a small 1-qt. saucepan over medium heat, stirring often; reduce heat to medium-low, and boil, stirring constantly, 3 minutes. Remove from heat, and use immediately. 5. 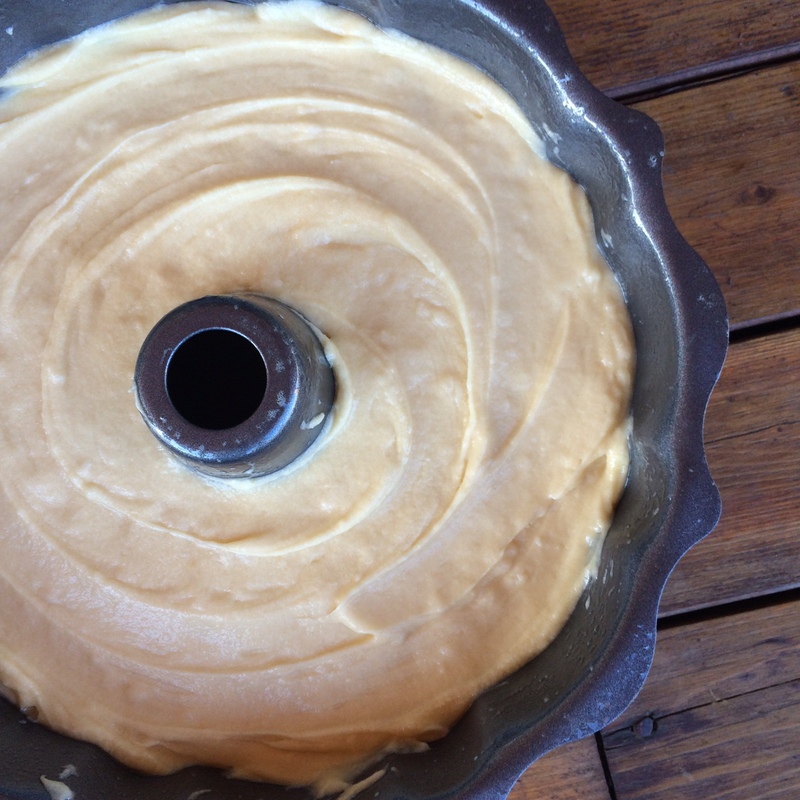 Remove cake from oven, and gradually spoon hot Amaretto Glaze over cake in pan. (Continue to spoon glaze over cake until all of glaze is used, allowing it to soak into cake after each addition.) Cool completely in pan on a wire rack (about 1 hour and 30 minutes). This was one of my all-time favorites. You could make my Birthday cake out of this and I’d be covered for the next three Christmases, Birthdays, Labor Days, President’s Days, and Halloweens in a row.